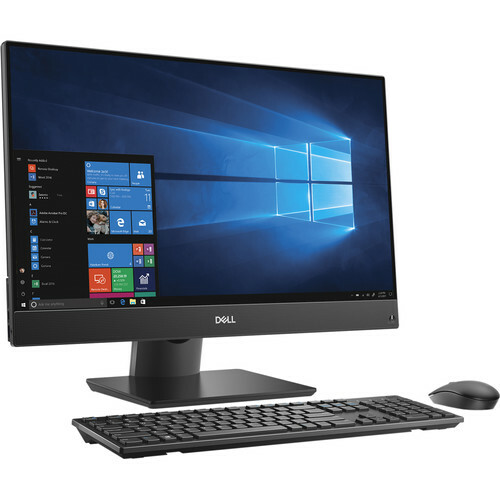 The 23.8" OptiPlex 7460 All-in-One Desktop Computer from Dell is a compact, space-saving system designed for users looking to tackle everyday tasks. Specs-wise, it's equipped with a 3.0 GHz Intel Core i5-8500 Six-Core processor, 8GB of DDR4 RAM, and a 500GB 7200 rpm HDD. Its 23.8" display, driven by integrated Intel UHD graphics, is built with an IPS panel and features a 1920 x 1080 resolution for crisp and clear pictures with vivid colors and wide viewing angles. To connect to the internet, the OptiPlex 7460 has both 802.11ac Wi-Fi and Gigabit Ethernet for a more stable and reliable wired connection. Other integrated features include Bluetooth 5.0, HDMI and DisplayPort outputs, USB Type-C and Type-A ports, a webcam, a microphone, speakers, and multiple audio jacks. The operating system installed is Windows 10 Pro. For your convenience, a USB keyboard and mouse are included, so you can get started as soon as possible. Box Dimensions (LxWxH) 32.5 x 19.0 x 8.0"